When I was young, I began to notice that men and women have very different sub-textual conversations. I became fascinated with a phenomenon I observed in my female friends. I would be in a social setting with a female when another female enters the room. My friend would suddenly turn and whisper some critical remark about the stranger. A few probing questions led me to the realization that within a nano-second my female companion had sized up the female who just entered the room and had filled out a complete mental dossier on her competition. She knew what the other female was wearing, her socio-economic status, what kind of person she was, and exactly where she was to be filed in the categorized file cabinet of her brain. The hi-speed, interpersonal judge, jury, and executioner from across the crowded room. As Wendy and I were in the depths of our journey through infertility, I became aware of just how deep and strong women’s thoughts and core beliefs around pregnancy and motherhood can run. In this unspoken, invisible world of non-verbal female communication there exists a sub-culture in which fertility is spiritual currency. If you are a woman who gets pregnant at the drop of a hat and cranks out multiple children in succession, then you are a female all-star, blessed and living right. If you are a woman struggling to conceive then there are some serious question marks surrounding you and this curse you are experiencing. There must be some reason God is withholding this fundamental female blessing from you. In yesterday’s chapter we left Job and his three friends on the ash heap. For seven days the four of them sat in silence when Job finally opened his mouth to speak. What poured out what was a highly emotional rant of despair that you might have expected from a man who had lost his children, his workforce, his wealth, and his livelihood before breaking out in painful sores all over his body. Today, the first of his three friends opens his mouth to speak. His name is Eliphaz, and he comes from the ultra-religious wing of society for whom life is very simple. Everything in life fits neatly into their black and white box and it parallels the thinking I’ve observed around fertility in certain subsets of the female population. If you are visibly prospering you must be living upright and piously because God is blessing you. If you are visibly suffering then you must have done something to deserve God’s punishment. Plain and simple. The Christian couple I read about in Pakistan who just last week were beaten to death by the Muslims in their village. 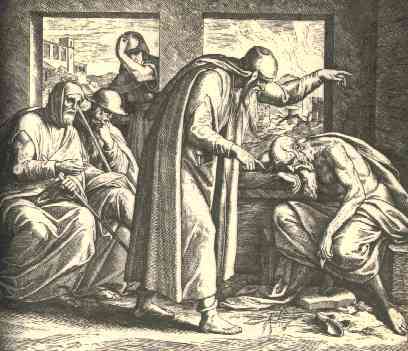 Job has suffered incredible tragedy and the first thing he hears from his friend is a backhanded accusation that he must have done something to bring down God’s wrath upon himself. Eli’s words reveal his heart. He is less concerned with showing love, empathy, and compassion to his friend, and more concerned with trying to reconcile what he’s witnessed with the rose-colored glasses through which he sees a simple black and white world. Today, I am thinking about those who suffer around me in ways I can’t comprehend. I am determined that I do not want to be a friend like Eliphaz. Trying to reconcile irreconcilable suffering within my personal world-view is less important than simply loving a suffering friend without reservation or judgment.